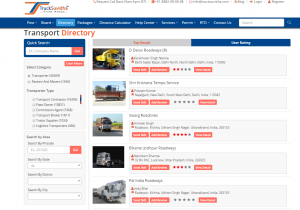 GET ONLINE TRANSPORTERS’ DIRECTORY WITH TRUCKSUVIDHA !!! USE DIRECTORY OPTION WITH TRUCKSUVIDHA, WHICH WOULD GIVE USER A BRIEF VIEW OF ALL THE TRANSPORTERS REGISTERED WITH TRUCKSUVIDHA. Online Transporters Directory to make your search more easy!!! TruckSuvidha always try to give something new and stimulating for its customers. It started with an online portal, then to ease they come up with their App and now they are opening their Directory for every customer related with their portal, which was initially opened to premium customers only. This feature would allow their user to see the number of transporters available within their vicinity and outside the region to get connected easily. This feature has been introduced by keeping in mind the outlook of Indian users who always want to go for trial before taking services and provide them a view of actual number of transporters registered with TruckSuvidha. It would enhance healthy and positive competition in market and would do well for customers who are actually are in need of services. TruckSuvidha believes in taking things online and now those traditional directories of transporters which a person needs to purchase and finding a transporter in that was such a tiresome task. 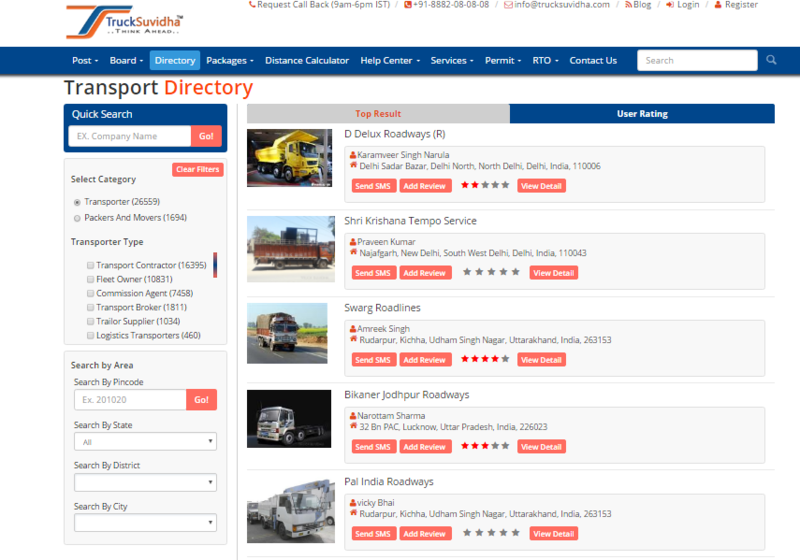 TruckSuvidha’s directory provides with Different filters which would allow user to search transporter according to its: Area Pin code, State, District or city, Name, Category of transporter, Transporter type/s. This directory provides the users to review transporter, contact him and view the details of transporter available with TruckSuvidha. This directory would give Transporter to get displayed all over country through it and get advertised at zero cost. It is a free of cost service being provided by TruckSuvidha to its users to get nationwide exposure and expand their customer base and business. Just take one step and get registered with TruckSuvidha to avail this benefit. TruckSuvidha always want its customer to be beneficiary and keep them above at all. TruckSuvidha is loaded with such features which include Truck Board, Load Board, Truck Post, Load Post, Distance Calculator; Application based use and now The Directory. It is the first time in Indian online transportation portals’ history that any company has initiated with such concept. TruckSuvidha is a leading online transportation portal of the country. It comes in market with an aim to transform Transportation and Logistics sector of the country. And despite of all odds, it is able to reach to such level. TruckSuvidha always keep faith in benefitting its users and here is one more example set by it. So user can come on TruckSuvidha website and use this feature, which is absolutely free and easy to use.